Come join us for KSL Season 2! KSL Season 2 starts its exciting journey on Oct. 18! The total of 16 players consisting of 13 players qualified through competitive online/offline qualifier matches and 3 players seeded last year through Season 1 will compete in the KSL Season 2 Group Stages. The 16 players (6 Zerg players, 6 Terran players, and 4 Protoss players) are allocated into four different groups through the draw ceremony. They will go through the Round of 16 to advance to the stage of Quarterfinal. 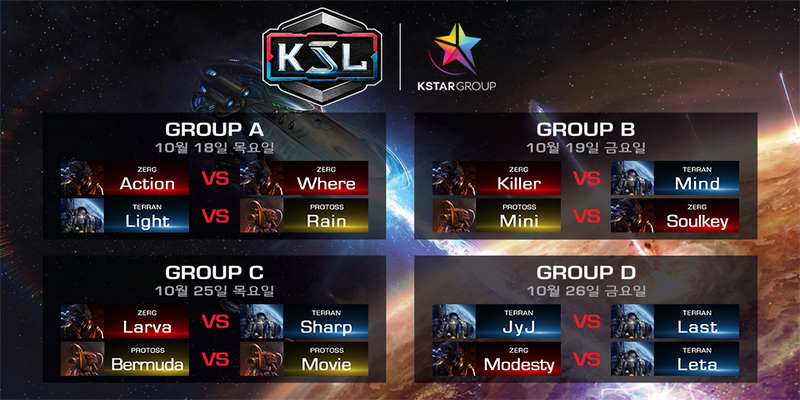 All matches of KSL Season 2 will be broadcast on StarCraft Twitch Channel in Korean and English. If you want to watch the scene on the spot at the KSl Studio in Shinchon, you can purchase tickets here. Thanks a lot for your interest in KSL Season 2.